One Cup of Water for the Washing Machine? Researchers say the technology, which uses less than 2 per cent of the water and energy of a conventional machine, could save billions of litres of water each year. The machine, which has been created by academics at Leeds University, works by using thousands of plastic chips – each about half a centimetre in size – to absorb and remove dirt. The story says the chips should last up to 6 months with up to 100 uses…does that sound right to you? Do you wash only 4 loads of clothes of clothes a week? What happens to the chips once they need to be replaced? Check this out! An Indiana man is drilling oil in his backyard. I often visit No Impact Man’s Blog and found this was posted while I was away this weekend. I hope to assist in spreading the word even to my small readership. If you have not ever visited his site…you are in for a treat! We can really make a difference. TODAY. But I need your help. Plus I have some free Reverend Billy DVDs to give away. I really, really need support from all of you today (and I’m unashamedly bribing you with the offer of free Reverend Billy DVDs). But first I have to give you some background. Just read the bits in bold if you’re in hurry. Next Friday, May 30, Representative Jerrold Nadler of New York’s Eight Congressional District has kindly agreed to meet with me in his New York office. As one of his constituents, I intend to ask Representative Nadler to support an effective global warming mitigation policy that is based not on what is politically possible but on what is scientifically necessary. Introduce, as soon as possible, a non-binding resolution to the House of Representatives asserting that we need a climate change mitigation policy with a goal of no more than 350 ppm of atmospheric carbon dioxide (read why here). Furthermore, the resolution should say that the United States must collaborate with the international community to achieve an effective successor to the Kyoto Protocol that will achieve the 350 goal or better (depending on how the science progresses). Pledge to support the 1sky.org policy platform that also includes creating five million green jobs (through, for example, weatherizing our buildings and manufacturing solar panels and windmills), and placing a moratorium on the building of new coal power plants. Pass on to House Speaker Nancy Pelosi a letter addressed jointly to her and Representative Nadler, in his position as Assistant Whip, asking them both to push for the introduction of new and the strengthening of currently pending climate change legislation to reflect the crucial 350 goal. This means, at the very least, aiming for an 80% reduction in climate emissions below 1990 levels by 2050 and a 25% reduction by 2020. Now then, here’s how I was hoping you could help. My dream is to present Representative Nadler and Speaker Pelosi with between 350 and 3,500 (10 x 350) emails of support for these policy objectives. Can you help? All it requires is a cut and paste job (see below). Fellow bloggers: would you be willing to pass this request onto your readers? Everyone: would you email this around and get your friends to pitch in? Representative Nadler has been an ardent supporter of environmental issues ranging from the thorough cleanup of the World Trade Center site to securing federal funding for state conservation and wildlife grants. He received a score of 95% for his voting record in the 1st session of the 110th Congress from the League of Conservation Voters. 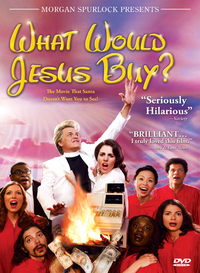 Reverend Billy and the Church of Stop Shopping have provided me with five copies of their new DVD, What Would Jesus Buy (watch the trailer here). I’m going to give the DVDs to people who send in their emails of support (the 1st, the 35th, 100th, the 350th and the 1000th). Simply cut and paste the below, making sure to substitute in your name, mailing address and email address, and send it to noimpactman+nadler+pelosi@gmail.com (it looks like a weird email address but, don’t worry, it will work). Thank you for your hard work on behalf of the people of the United States. It is indisputable that the health, happiness and security of the American people depends upon the well-being of our planetary habitat. It is also indisputable that the anthropogenic emissions of greenhouse gases is causing changes in our habitat that will adversely effect Americans on every level–from our health to our economy. On May 30, Colin Beavan aka No Impact Man will visit Representative Nadler to express to him support for a number of climate change mitigation policies that are much stronger than those currently passing through Congress. Please consider this a letter of support for the measures Colin Beavan will be advocating. Introduce, as soon as possible, a non-binding resolution to the House of Representatives asserting that we need a climate change mitigation policy that accords not with what is politically possible but what is scientifically necessary–a goal of no more than 350 ppm of atmospheric carbon dioxide (read why here). Furthermore, this resolution should assert that the United States must collaborate with the international community to achieve an effective successor to the Kyoto Protocol that will achieve the 350 goal or better (depending on how the science progresses). Pledge to support the 1sky.org policy platform that also includes creating five million green jobs (through, for example, weatherizing our buildings and manufacturing solar panels and windmills) and placing a moratorium on the building of new coal power plants. Push for the introduction of new and the strengthening of currently pending climate change legislation to reflect the crucial 350 goal. This means, at the very least, aiming for an 80% reduction in climate emissions below 1990 levels by 2050 and a 25% reduction by 2020. I have just been introduced to a new blog…well, new to me anyways….at Wisdom of the Trowel. There, I found an entry about an article for which I had been searching for a few days now. An opinion piece entitled, Civilization’s Last Chance, in the New York Times discusses humanity’s never-ending belief that there will always be second chances and “do-overs” when it comes to our ecological environment. Filled with metaphors, this article offers a grim look at a future headed for disaster if emissions are not limited quickly. I would like to send a special thank you to Lewru for posting the article along with the link. I had seen several blogs discuss the article without giving credit to Bill McKibben or the New York Times. My friend, Anita, at Prairie Dreams blogged about Gas Prices today. The more I thought about $130 a barrel fuel…the angrier I became. I began to leave a comment, which began to turn into a pretty long comment, so I thought in all fairness to Anita I should move my overloaded mouth to my own blog. This is an official RANT happening before your very eyes folks! And as with most of my rants, my thoughts usually flop out on the screen in huge messy chunks…so I apologize up front for any randomness or incoherent moments. Fuel is expected to skyrocket in June. WHAT? What the #&@! is it doing now? I cannot imbed this video, but you can go to Chicago NBC NEWS to watch a video clip about $4.39 fuel or this clip about People Expressing Anger. They use some of the same footage in both. $4.39 is not even the highest per gallon found in Chicago. The Capital Group reports that Goldman Sachs predicts $200 barrel oil in 2008. One of the videos states we should brace ourselves for a rise in prices during peak summer driving times. How can we, the average people, make a difference in what is happening all across our nation? Some of us, out of necessity, are making individual differences in how we are surviving this crisis. On Prairie Dreams Blog, some of the comments note that people are being more conscientious about combining trips and try to cut down on unneccesary travel. These fuel prices are not only affecting the pumps, but we see it in our grocery bills as well. I was in stunned in disbelief when 18 ct. eggs jumped over an dollar in the matter of a month. Milk at over $4 a gallon even at the large grocery chains. What can we do? Everyday people are making life decisions…do I buy milk and bread for the table or do I put fuel in the tank? There should be some law stating people should not be put in the position to make these kinds of decisions. Okay,okay, I know that there are many people who have had to make these types of decisions since the beginning of time, but come on! This is ridiculous! I wonder what would happen if a large portion of U.S. citizens just decided NOT to go to work for one day. Now, I realize that most Americans cannot afford to miss a day of work, but there are those that are able. With the prices rising faster and higher, I feel it won’t be long before people cannot afford to drive to work and will be making that choice…do I drive to work today or do I put food on the table? What if there was a movement toward a 4 day work week until this crisis is over? For employers who could shut down for one day a week, they would have the added benefit of cutting heating and cooling costs. We have a school district south of us who went to a 4 day school week and I have heard positive things about it. There were many obstacles to overcome in the initial transformation, but for the most part I believe it was a positive move. I have seen email forwards asking for every person to not purchase fuel on a particular day, but that has not seemed to make a difference. I think NOT going to work for a day…..WOULD! Maybe I am delusional…I am not economist, nor do I play one on television, but it seems there would be some relief, if not some kind of satisfaction, in a cohesive campaign. What do you think? Would you like a table or a booth? The old adage “we are what we eat” hits too close to home after watching this video about Garbage Island in the Pacific Ocean. I saw the documentary on television some time ago and I was amazed at the footage. The floating island of trash is said to be twice the size of Texas and 80% of it is comprised of household and municipal waste, filled with plastic. Plastic is not biodegradable, it is photodegradable, which means it will always remain as plastic. In this floating monstrosity tiny pieces of plastic are floating about with an array of larger discards. Filter feeder fish, such as jelly fish, take these plastics into their systems. Well, we all know how the food chain works. Big fish eats little fish, which is then eaten by a bigger fish, and another until it makes it on our dining room table. Concerns over the chemicals in plastics infiltrating our food chain have prompted studies in Japan; where women with high levels of these toxins have been know to have multiple miscarriages. Doctors in Hawaii express concern over the high levels linking to early onset diabetes, liver disease and kidney disease. I love fish…especially shellfish, salmon, and grouper. Living in landlocked Kansas, I rarely have an opportunity to dine on any of my favorites, but occasionally I am able to sit down to a bit of catfish or trout….some of which I have angled myself…however, even our Kansas waters woes concern me over what I am consuming, but I will save that for another entry. OH MY! 67K from 1/2 acre???? “On a fringe of Philadelphia, a nonprofit demonstration project used densely planted rows in a half-acre plot and generated $67,000 from high-value crops like lettuces, carrots and radishes.